The only thing more pointless than the flood levy (unless you happen to be particularly obsessed with a pretty bottom line during an election year, and You Know Who You Are) is adding to all the fuss and bother by opposing it rather than just raising a sarcastic eyebrow and waving the bloody thing through. Tony’s even appealed for donations for his campaign against the levy. 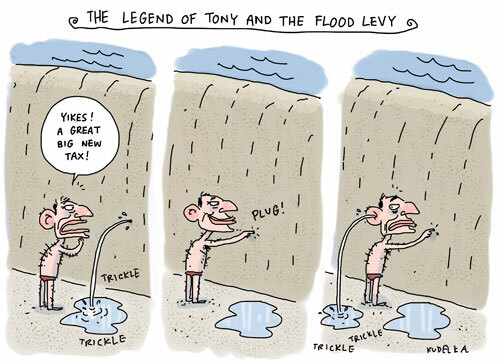 In case you were wondering, if you do in fact donate money to Tony’s campaign against the flood levy rather than, well, the actual flood relief appeal, there is something wrong with you.